Riding high on buzz it has created for the last couple of weeks Gunday is all set for a good opening tomorrow. The movie is among the most anticipated movies of the year mainly because the quality of the content seems to be good. The chemistry of the lead pair i.e. Arjun Kapoor and Ranveer Kapoor is looking incredible and they can set the silver screen of fire. Priyanka Chopra is looking absolutely gorgeous in glamorous avatar and is raising the required oomph factor of the movie. Irffan Khan, what can we say about him. His mere presence can only adds to the merit of the movie. The trailer has been received well by the masses. The songs of the movie are climbing up the popularity charts with each passing day. The movie seems to be having all the ingredients of a perfect Bollywood package. What remains the is how director Abaas Ali Zafar has packaged these ingredients. With the excitement it has created among the audience and a good release date, Gunday should open well at Box Office. Since the movie seems a mass entertainer with value for both multiplex as well as single screen audiences, it should get a 60 to 80% start at Box Office. Both mass centers as well as multiplexes are expected to open up evenly. Since the movie is releasing on around 2500 screens, it should collect around 40 to 45 crores in its first weekend unless its a total let down. The first day collections of the movie would be around 14 to 16 crores which is a good figure considering the fact that it is not a Khan or Kumar starer. If all goes good for Gunday than it can be the first bonafide Super-Hit of 2014 with lifetime collections of around 120 crores. What are your expectations from the movie. Are you going for Gunday tomorrow. Do share with us and keep visiting Blog to Bollywood. 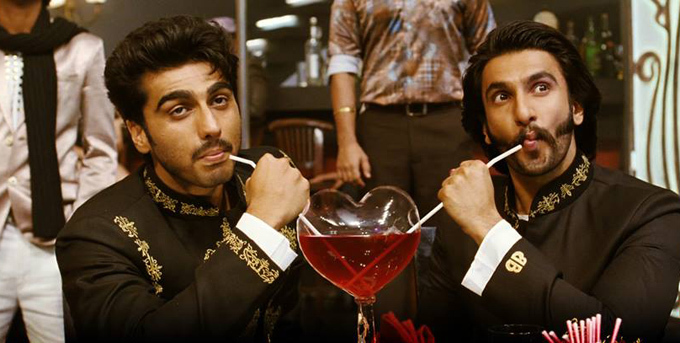 Gunday Movie Review | As we said Ranveer and Arjun are the show thiefs.